Uh... what hook was I using? I've had a problem with too many projects, and often times I need that hook I was using for an older, hibernating project for a shiny new project. The problem then arises when I go back to the old project, often one without instructions or one where I've gleefully ignored the instructions, and can't remember what hook I was using (and/or found out in shifting it I've accidentally ripped out a bunch of work). Then it hit me - an idea so simple I can't believe they're not on every store in the country! Maybe because they think people finish one project before they go on to another? (*snort*) Or maybe because it's so simple. Grab a large necklace hook, a piece of thread, and some beads - regular and alphabet - and VOILA! The necklace clasp goes around the working loop to keep it from unraveling, and the alphabet bead reminds you what hook you are using! You can also use numbers, if you're using steel hooks or one of the 'in-between-the letters' aluminum hooks. Totally simple to quickly slap together a whole set! Now I can start hundreds of projects without having to buy more hooks! Wait... I thought this was a good idea?! I need to do this...right away! It fixes my two main problems! I'm just a beginning to crochet but this is a brilliant idea. Thank You! Absolutely BRILLIANT!!! Now I need to find someone to make them for me!! Life is like a box of pudding - it only gets messier! Destined to be a crochet-y old lady! You know, you could probably market this on Etsy. Sell some individually (like the most commonly used hooks - G,H,I,J) and sell some full sets. I think it'd work. I'd buy them! Seriously brilliant! I will definitely be using this idea!!!! Thanks bunches for sharing!!!!!!!!!!!!!!! Very nice! I use something similar because I too have way too many projects going and could never remember what hook I was using with what project. I use a coiless safety pin and slide on a decorative bead or two and then a letter bead and then another decorative bead or two. That's it. I pin one on every project as soon as I start it! I actually use almost the exact same thing on my ufo's when I steal the hooks from them, but yours are much prettier than mine. Brilliant! This is the kind of thing that revolutionises my craft space! I keep on buying extra hooks hoping that leaving the hookwith the project will help but they still fall out or get removed! this is a really great idea!!! There are projects that I set down and don't go back to for two years and part of the reason I haven't picked it back up is that very issue. I have no idea what hook I was using. Brilliant. What a great idea thank you for sharing. 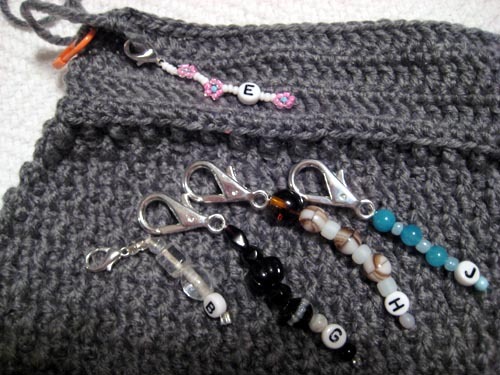 Awesome, I always leave my hooks in my crochet, but so many wips can eat so many hooks! I'm wisting this when I get home! Loved your post. Great idea! Enjoyed just reading it. if you need it to stay straight, jewelry pins work great to slide the beads on and loop the clasp on the end of that. wow what an amazing idea, My neddles are always falling out of my projects and this would absolutle fix that, Thanks for the idea. I absolutely love this idea and I've already got everything to make them!! Great thing to add to my mom's crochet needlecase that she's getting for Christmas too. Thanks for the idea..sooo stealing it!! From a 59yo woman who has crocheted for over 40 years and is being overrun with unfinished projects cause I couldn't remember what hook I was using THANK YOU, THANK YOU, THANK YOU! Now I'm off to find letter beads and clips or safety pins. YES! How did I miss this post!! 6 months of extra ripping and wondering! I wuv you!! This is absolutely genius! I have more projects "running" than I can count, and obviously don't have enough hooks to keep with each project (and I swear hooks grow legs and walk off somewhere... probably hiding out with the missing socks!). Thank you so much for sharing your brilliant idea. I have to agree w/ other posters-- "I'd buy 'em!" In the meanwhile... maybe I'll find some of those missing socks and repurpose them with lettered beads! I am glad you posted this in crochet-- I think that it's the correct place for it. If only I had something like this months ago! I've done this so many times!! Add another "This is a brilliant/genius idea" to the accolades!! And such cute designs too. For me, it's the perfect marriage of my two favorite crafts.¡Gracias! for sharing. I have a stash of plastic and pony beads that have been sitting around in my craft box for ages that I didn't know what to do with, and now I see they finally have a purpose. Thanks so much for the idea. You are a total genius. I've made something like these that I sold. But none so beautiful. I love all the colors.